It could be argued that David was merely a bit lax in his expression. By "increased more" did David mean the ocean heat content is higher than ever observed before or did he mean the difference from one quarter to the next has never been greater? Even if David did make a mistake and mean the latter, it's hardly 'science fiction' to miss a slightly higher change in a single quarter going back eight years earlier. Okay, the above chart doesn't look scary until you see what it is. 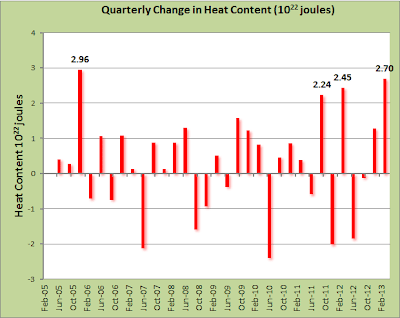 Once you realise it's the change in heat content from quarter to the next (non-cumulative), and that there are many more quarters in which heat content is rising than falling, it becomes more of a concern. 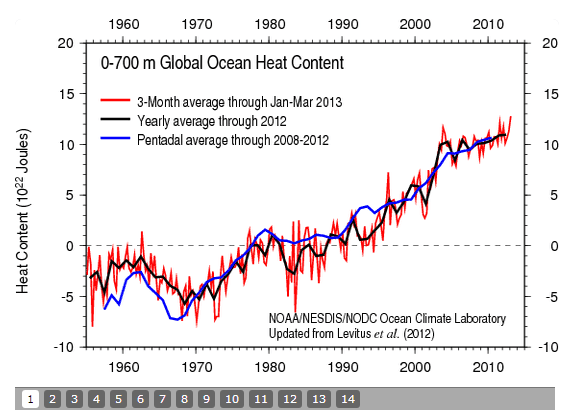 Let's look at this ocean heat accumulation more closely. Heat content rose by 10.4x1022 joules in only eight years. 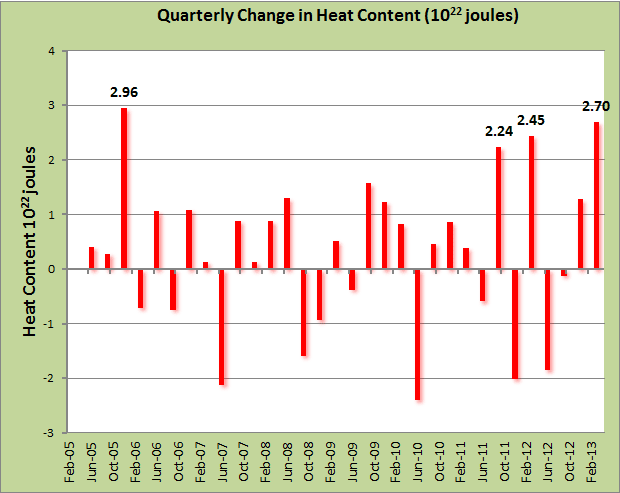 In the last quarter it rose by 2.7x1022 joules or 26% of the total amount of heat added over that period. 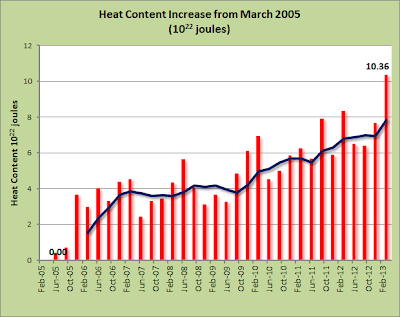 Since the 1960s the heat content has risen by nearly 30x1022 joules. That's a lot of Hiroshima bombs. 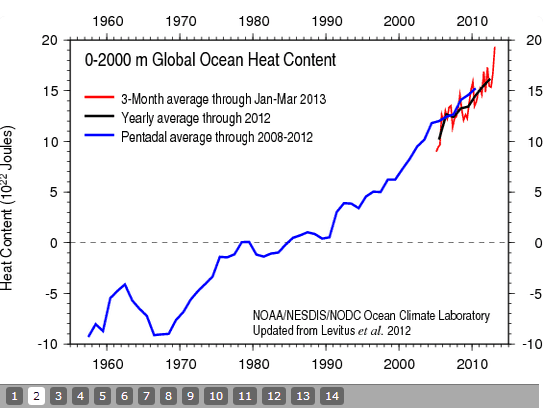 Certainly there are ups and downs over time - but overall the heat content of the ocean is going up, up, up. So Bob tricks his readers by making it look like there's not much change. What does he do next? Well, his next trick is to show his readers some ocean areas where there hasn't been a huge change in warming - since 2005 only - the North Atlantic and the North Pacific. (I haven't checked these but let's assume he is correct). It’s plainly obvious that the ocean heat content of the tropical Pacific would cool over the long-term without the 1973-76 and 1995/96 La Niña events. To sum up, Bob seems to be telling his readers that a perpetual warming of the world's oceans is 'normal'. 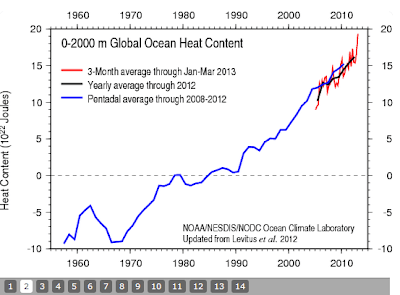 That it's of no consequence that the heat content of the top two kilometres of ocean has risen by 10.4x1022 joules in only eight years. I wonder how long he will think like that? Can you see him saying down the track: "Oceans are boiling*? Nothing to worry about, folks. The quarterly change has been higher in the past!" What's weird is all the congratulations Bob gets for outing the scaremonger. Must be that conservative brain at work again, relieved that the numbers can't be all that scary because Bob told them "it's natural". * No, I don't believe the oceans are about to literally boil! "Bob Tisdale is well aware that WUWT-ers don't like scary stuff"
Pretty much sums up climate change denial. And tobacco denial. And asbestos denial. Or is it because the climate and ciggies don't respond to a civilianised assault rifle being pointed at them? One to ponder. Don't forget the most important denial: denial denial :-). Ooh yes, they are heavily into denial denial. ...but climate science is still a hoax because I hate taxes"